We’ll show you how easily you can create a fantastic Temperature and Humidity Datalogger device which draws graph on TFT display and stores the acquisition data on the microSD card. We have added an extra autonomous battery power supply feature, so you can carry around your datalogger where ever you go. Just connect mikromedia for XMEGA, Battery Boost shield with SHT1X PROTO temperature/humidity sensor using wire jumpers, click the microSD card in the socket and you got the hardware you need. We have created an open-source datalogger application in mikroC, mikroBasic and mikroPascal compilers for AVR and you ca freely download it from this webpage. 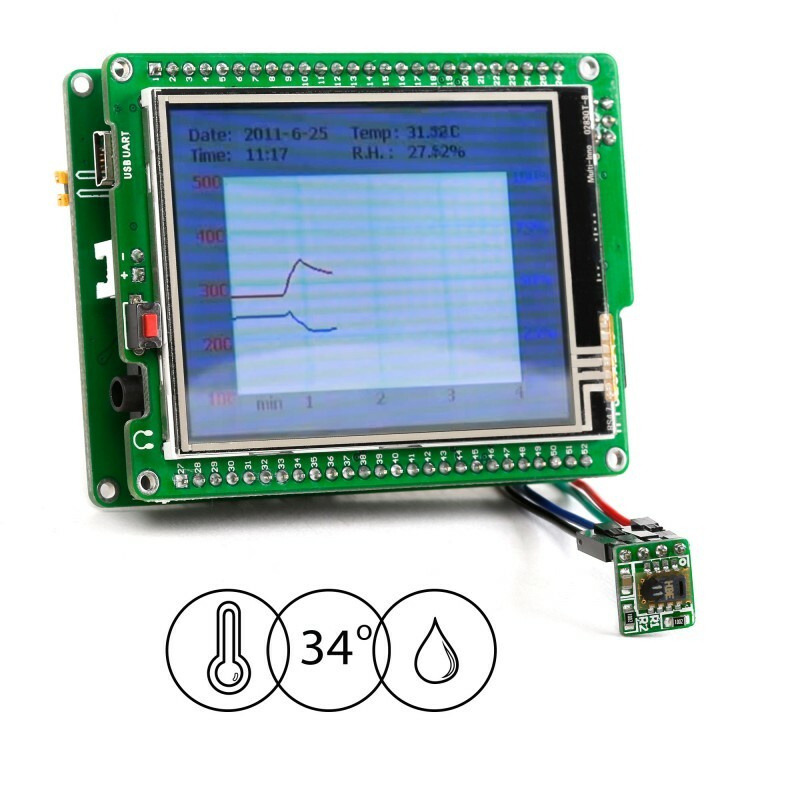 The SHT1X PROTO Board is used to connect your prototype device with a temperature/humidity sensor. It features the SHT11 sensor that uses a 2-wire serial interface, thus enabling you to measure temperature and humidity. Note: not recommended for new design. Battery Boost shield is an extension board pin-compatible with all mikroMMB boards from mikroElektronika that enables autonomous power supply using 2 x AAA batteries. Board features a compact monolithic integrated circuit MCP1640 that provides +4.0V power supply voltage. Smart programmable touch 2.8'' display, packed with features. Mikromedia can be used for controlling a wide range of applications: from simple hobby projects, up to entire machine installations. It is powered by ATXMEGA128A1 microcontroller unit, it gives you true power to build GUI-centric embedded applications.